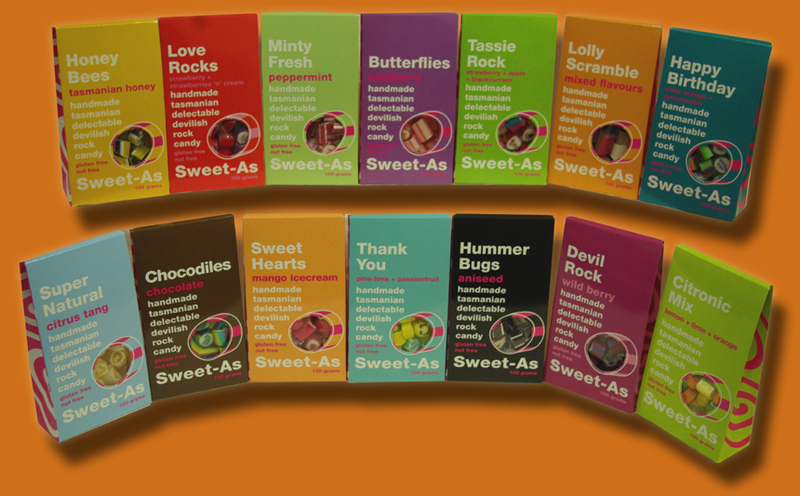 Sweet-As, handmade Tasmanian delectable devilish rock candy! “Rock candy” begins its life as sugar, water and glucose, in exact ratios, which are put into a pot and boiled. Once the candy mixture has reached the correct temperature, flavour is added and the molten mixture is then poured from the pot onto the cooling table. Colour and citric acid are added at this point. Once the candy mixture is cut and cooled, the construction of the rock candy lolly can begin. With nimble hands, one candy maker starts stretching and pulling the candy mixture over a hook (making the mixture take on a satiny appearance) whilst the other candy maker contorts the candy mixture into shapes. Then they both start sculpting and constructing the rock candy lolly with skill and speed. Letters/names and pictures/logos can be included at this stage within the overall design. The lolly, which is now a gigantic version of the final product, is then extruded into thin rods that are rolled, cooled and chopped into yummy bite sized pieces or formed into spirals for lollipops. The process takes anywhere from 20 – 50 minutes from start to finish. Customised Tasmanian Made Rock Candy.